Lacquer Ware is an antique craft of India and Kutch also. The Slices/ ‘Lac' or ‘Lakh' is originally come from the Sanskrit Slices/ which means hundred thousand. The material Lac is arisen from a little insect which discharges a sticky substance to shape itself a protecting cover. It takes about one lakh and fifty thousands insects to make just half a kilogram of shellac. The insect lives in particular types of trees including Babul which is common in Kutch. Wood of the tree Babul is given a irregular shape by using an axe. Afterwards, it is twisted on a simple short lathe (Machine for shaping woods), called as Sanghedas using a shape. A coloured lac stick is useful on the rotating wood to give the wood a tough solid level, while it is still on lathe. Then, by pressing another piece of wood against it, resistance causes the lac to warm and liquefy and therefore, spreading it into a still covering the wood with a tough solid coat. An application of groundnut oil is used to make the final process without any difficulty. By operating different colours in layers, a variety of effects are accomplished. Often, a top layer of the colour is chiseled off in a geometric or flower-patterned to expose the colours below. 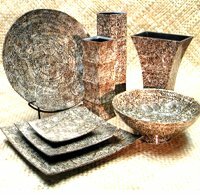 Lacquer Ware is a twisted wood covered with coloured and often patterned lacquer. The main lacquer Ware products of Kutch are chakla – velan (Chapatti roller and board), charpai (bedsteads) toys, bajoth (stool), khandani (grinder and mortars) pots for storing spices and dandia (sticks to play folk dance).